The inner most fear of every human being is reaching the stage in which he or she becomes a burden on their family members. Let us help you overcome this fear and heal your body and mind. Osteoarthritis is the most common cause of joint disabilities in middle and old age. It is a form of arthritis that features the breakdown and eventual loss of the cartilage of one or more joints.. Osteoarthritis occurs more frequently as we age. Before age 45, osteoarthritis occurs more frequently in males. After 55 years of age, it occurs more frequently in females. Osteoarthritis commonly affects the hands, feet, spine, and large weight-bearing joints, such as the hips and knees. Osteoarthritis usually has no known cause and is referred to as primary osteoarthritis. When the cause of the osteoarthritis is known, the condition is referred to as secondary osteoarthritis. Primary osteoarthritis not resulting from injury or disease, is mostly a result of natural aging of the joint. With aging, the water content of the cartilage increases, and the protein component of cartilage degenerates. Inflammation of the cartilage also stimulates new bony outgrowths (spurs, also referred to as osteophytes) to form around the joints. Secondary osteoarthritis is a form of osteoarthritis that is caused by another disease or condition. Conditions which lead to secondary osteoarthritis include obesity, repeated trauma or surgery to the joint structures, abnormal joints at birth (congenital abnormalities), gout, diabetes and other hormone disorders. Obesity causes osteoarthritis by increasing the mechanical stress on the joint and therefore on the cartilage. Repeated trauma to joint tissues (ligaments, bones, and cartilage) is believed to lead to early osteoarthritis of the knees in soccer players and army military personnel. Uric acid crystal deposits in the cartilage cause cartilage degeneration and osteoarthritis. Grade I cases present with symptoms of pain in the affected joint(s) after repetitive use. Joint pain of osteoarthritis is usually worse later in the day. There is swelling, warmth, and creaking of the affected joints. Pain and stiffness of the joints occurs after long periods of inactivity (for example, sitting in a theater). Grade II cases of severe osteoarthritis where there is complete loss of the cartilage cushion causes friction between bones, causing pain even at rest or pain with limited motion. Symptoms of osteoarthritis vary greatly from patient to patient. Some patients are debilitated by their symptoms. On the other hand, others may have remarkably few symptoms in spite of dramatic degeneration of the joints apparent on X-rays. Symptoms also appear intermittently. It is not unusual for patients with osteoarthritis of the finger joints of the hands and knees to have years of pain-free intervals between symptoms. Grade III stage of Osteoarthritis of the knees is most of the time associated with excess upper body weight, with obesity, or a history of repeated injury and/or joint surgery. Progressive cartilage degeneration of the knee joints lead to deformity and outward curvature of the knees, which is referred to as being “bowlegged”. 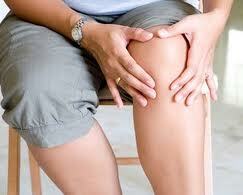 People with osteoarthritis of the weight-bearing joints (such as the knees) in the long run develop a limp. Osteoarthritis of the cervical spine or lumbar spine causes pain in the neck or low back. Bony spurs, called osteophytes, that form along the arthritic spine irritate spinal nerves, causing severe pain which radiates from the spine along with numbness and tingling of the affected parts of the body. Homeopathic medicines are definitely suggested for Osteoarthritis, these medicines slow down the degenerative process and offer considerable pain relief in Grade I stage. 60 to 70 % of the cases are managed by homeopathy along with some basic exercises and physiotherapy and the patient is saved from the effects of anti-inflammatory drugs. There is marked improvement in the stability and weight bearing capacity especially of knee joints with Acid Benzoic, Sticta and many other such indicated homeopathic remedies. About 60-70% of severe cases with Synovitis and fluid collection show response to homeopathic medicine like Iodium and Apis within hours thus avoiding tapping and analysis of fluid unless tubercular or malignant changes are suspected. Homeopathy medicines Argentum Nitricum and Slag carry out the role of Glucosamine and take care of cartilages and are well tolerated by the patients. In cases where arthroscopy is said to be inevitable, homeopathic medicines save the patient from the procedure and even elderly people then independently do their routine work and also jobs if they want to. Suggested intercurrent medicines called Nosodes are prepared from the diseased tissue (Osteo Arthritic Nosode) are known to tackle adverse cases. Homeopathic medicines also help to improve the general health, control obesity and deeper study of the cases help in tackling the root cause and take care of the familial tendencies thus reducing the progress of the condition. Precise homeopathic medicines like Conium and Spigelia are highly beneficial for knee cap ailments and reduce Osteophytes by 30-40%. People opting for knee replacement should not forget that the life of the replaced joint is also 12-13 years and largely dependent on the usage of the joint so if done in young and middle age group the complaints may return after a few years of wear and tear.